Hike it Baby members love to spend time outdoors but also love to read about nature! These book reviews are some of our members’ favorite books that are hiking or outdoors related. From infant board books to adult page turners, these books can help inspire the family to love being outside. This rhyming book takes the reader through each season, describing the things you see, feel, touch, taste, smell, take back inside with you, and last but not least- cleaning up after coming back inside. My 3 year old loves how we sing instead of speak it to him, as the rhymes are just begging to be sung. The pictures and words spark memories for him from our own adventures outside, for example talking about the time we ate the icicles that had formed on our rhododendron bush. As a bonus, the book includes children from different racial backgrounds and both genders. As spring blows in to Casper, WY I am seeing birds’ nests popping up all over town. We have three in our backyard alone and if the crows come back this year we’ll have a nice stinky one high up in the tree in our yard. My one and a half year old son is just starting to discover that more animals exist beyond kitty and puppy who live at our house. We marvel at the squirrels jumping from tree to tree and the ducks down by the river and now he’s discovered birds! This charming book teaches us in rhyming verse about 14 different kinds of nests and the birds that build them. Each of the author’s choices are unique and interesting even for adults–some nests are made from bird spit. Did you know that? We learn about the nests of tiny birds like the hummingbird and giant nests built by eagles. Spoiler alert–the emperor penguin build’s a living nest! Each page has the main text and then in more detailed smaller print there’s a explanation of the nesting habits of that particular bird. We found this book at our local library, but I think it’s one we need as part of our permanent collection. It’s charming, informative, and perfect for helping my wild child understand our wonderful, wild world. Feeding chickadees is a magical experience for all ages. This book is the perfect companion to capture the feeling and adds a bit of context for those interested in learning more about these cute & curious little birds! Best enjoyed with a cup of hot chocolate! What a refreshing read! This book is a fairly quick read, mainly because it’s so good you don’t want to put it down for even a second. The story of Patricia and her young daughter hiking the highest mountains in New Hampshire is inspiring. 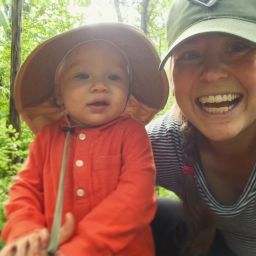 As I read through I found myself happy that I’ve already been hiking with my son which has contributed to his love of the outdoors, excited to set goals and hike some more, and daydreaming of going on even more, bigger adventures. A point made throughout the book is that yes, children can do more than we sometimes give them credit for. Patricia and her daughter are great examples of this. Their relationship with each other and the outdoors is amazing. Reading about their journey was a lot of fun. When reading you find yourself in the moment, right alongside them, hiking your way up a mountain. You feel the enthusiasm to take on the next challenge just as her daughter does as she’s ready to climb the next mountain. I found myself setting more goals, excited and ready to get outdoors and on the trail more regularly. If you get the chance to read this book, do it! You won’t regret it for a second. This is a very cute and fun picture book to read with your kids! Brother Bear, Sister Bear, and Cousin Fred go out on a Bear Scouts hike to earn their trail blazing merit badge, but Papa Bear wants to help and show them how. Papa Bear gets himself in trouble, while the cubs follow behind. The story is written in a fun, rhyming style that keeps kids attention and lets them feel the ups and downs of the bears’ Trail Blazing adventure! Very silly and cute! A perfect story for your outdoorsy little one! Hike it Baby now has a Goodreads Group! Join today and add books to our bookshelf! Looking for more member reviews? Search our blog for other Book Review posts! Want to share a book that you love about the outdoors? Submit your review here to be included in an upcoming blog post! Off Trail Book Reviews. permalink. Thanks for these book ideas!! Just put a couple of them into my Amazon shopping cart to buy for birthday gifts!